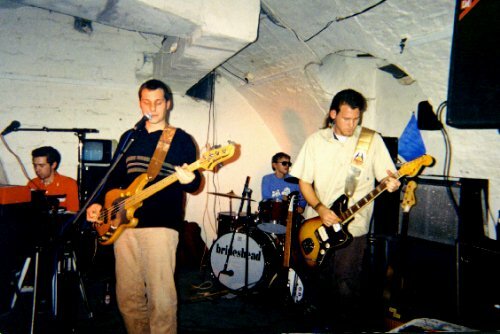 INVITATION Fragile were invited by Hanns-Christian Mahler of Apricot Records to play at the Apricot Nights 'release party' along with Brideshead and Mondfähre on 6th November 1998 at the Schlachthof in Wiesbaden. This was to coincide with the release of the 'Airpop' Apricot compilation CD and Fragile's own seven inch e.p. single, 'Worlds Apart'. 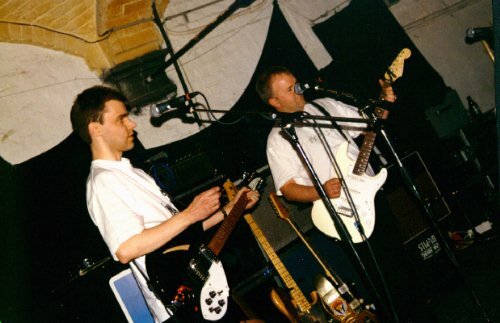 Unfortunately Rob & Steve of Fragile were unable to attend and therefore Neale & Mark decided to play as a duo and made the journey to Germany. 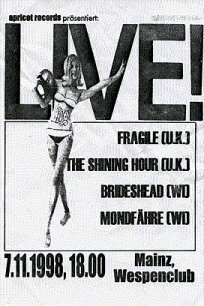 It was decided that a Shining Hour set should be performed which would also tie-in with the release of The Shining Hour seven inch e.p single, 'Five O'Clock Rise'. 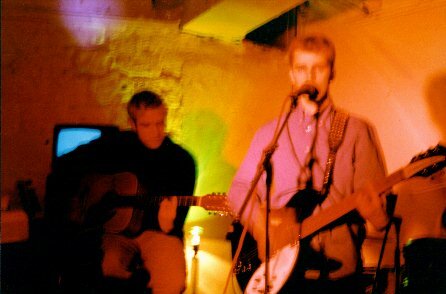 A second gig at the Wespenclub in Mainz was arranged for the following evening. WIESBADEN Neale & Mark flew into Frankfurt on Friday 6th November and were met by Hanns-Christian. Hanns-Christian drove us to his home and gave us copies of the Fragile single, The Shining Hour single and the Airpop CD. We were astounded by the artwork and presentation of the singles and CD. This was the first time we had seen the covers as we had resisted the temptation to look at the pictures on the Apricot website. Later, we had a look around Wiesbaden - a rather beautiful and picturesque German town - quite reminiscent of towns in Sussex, England where we come from. We were fascinated by the wonderful red market church and the natural hot spring which is quite a well known feature of Wiesbaden. THE VENUE Soon it would be time to go to the first venue - the Schlachthof. The literal transalation is abbatoir and that is exactly what the building used to be. For some time a huge hall has been used to house a flea market and some smaller rooms have been used for bands to rehearse in. One of the larger rooms is now a club and is a popular Wiesbaden venue for gigs. Before we went to the venue we drove to Brideshead's practice room to collect some equipment and meet the other members of Brideshead - Martin (singer and Apricot partner), Zwen (guitar), Paul (bass) and Daniel (drums). Once we reached the venue the process of unloading the gear and setting up the P.A. took place - except Neale and Mark didn't have to do anything! Here, we met the guys from Mondfähre - Bernd (keyboards), Yogi (bass), Daniel (guitar) and Christian (drums). Whilst Mondfähre were soundchecking we met Andreas and Olaf (who was involved in the 'Take A Look At Max' single) and Johannes (Apricot partner). Johannes had the task of manning the merchandising stall for the evening which had many fine items for sale including Fragile singles, tapes and t-shirts, The Shining Hour single, the Airpop CD, Brideshead CDs, Mondfähre CDs and Elegant t-shirts. Andreas and Olaf were going to be DJ-ing before and after the bands. Eventually it came around to our soundcheck. Even though we had been practising for a month before the gig, it was still strange going onstage without our 'rhythm section'. We were due to be playing two sets; one as The Shining Hour and another as Fragile and therefore soundchecked a couple of songs from each. One thing that amazed us was the 'backstage' area - for one, there was a backstage area! At the venues we have played at in England, the backstage area is otherwise known as the toilet! Also, there was food and drink freely available. We commented on the fact that when we have played in England you are lucky to get one beer and a bag of crisps! Shortly before we were due onstage, we did an interview for the Friday night 'Randomizer' radio show on StadtRadio Göttingen with Ingo, Holger and Dirk. It was great fun and they were nice guys. It seemed we were beginning to learn what it was like to be pop stars! THE SHINING HOUR When the doors opened we were amazed at the number of people who were coming through the doors. By the time we were due onstage, there were over 200 people packed into the club! We took the stage and tuned the guitars. 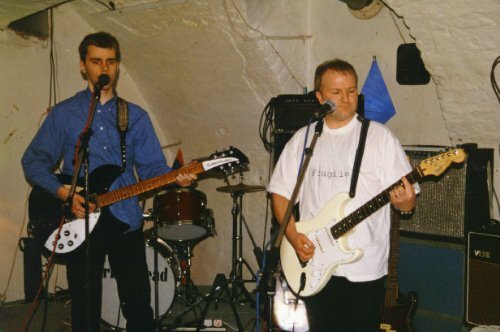 We were using Brideshead's guitars - Neale was using Zwen's Fender Stratocaster and Mark was using HC's black Rickenbacker 330 (just like his own). Mark announced in German that we were The Shining Hour (and nervous!) and we started to play 'I Don't Want To Know'. None of The Shining Hour set had ever been performed live before. Despite a few mistakes, the set went well and the audience were very receptive. We did three songs from the single in all. Mark performed a new song solo called 'Warmth Of The Sun' and Hanns-Christian joined us on 12 string acoustic for 'I'll Come Running'. The final song played was 'Five O'Clock Rise'. The set was a little nerve-racking, rough around the edges at times (Mark forgetting the lyrics!) but, overall, very enjoyable. After, we headed back to the backstage area for a drink. BRIDESHEAD were due onstage next and this was something that Neale & Mark were looking forward to seeing. Brideshead were augmented by Kai Schoppe (trumpet) and Andi Winkler (trombone) who are normally part of the ska band, The Skatalites. 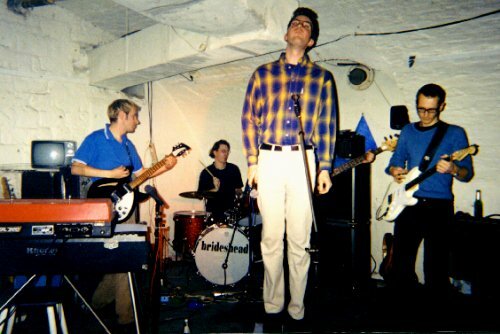 Brideshead played most of their great album 'Some People Have All the Fun' plus some 'Elegant' songs. The songs really came to life with the brass section. Without wishing to embarrass them, Daniel and Paul are a tight rhythm section, Zwen is possibly the coolest looking guitarist in Germany (maybe Europe! ), Martin's singing in English was so good, someone thought he was English (he seemed pleased about this!?) and HC, despite, looking a little anxious at times, kept those jangly melodies going and smiled a few times too (only joking!). They were great! FRAGILE We again took the stage - this time in our Fragile guise. It was a shame that Rob and Steve couldn't come. We knew we were certain to lack power with some of the songs. After all, we had played most of the songs as a full band for years but the audience didn't seem to mind. We started with a new song by Neale called 'Everybody Says...' followed by the lead track from the single, 'Worlds Apart'. 'Wednesday's Child' was next complete with a messed up guitar solo by Mark. Oh well...! During the rest of the set, we performed our first ever cover version, Crowded House's 'Four Seasons In One Day' which seemed to be received really well. Phew! Neale played solo on Smiths' favourite 'Please, Please, Please, Let Me Get What I Want'. The end of the set came soon with the first ever performance of 'Useless' from the 'It's A Lie' tape. The dual vocal harmonies went very well and we thanked the audience for the kind applause and cheering. Two guys came onto the stage and asked for an encore of 'It'll End In Tears' but sadly we hadn't rehearsed this and we thought we should vacate the stage for Mondfähre. However, thanks a lot guys. It's nice to know someone loves us! MONDFÄHRE are usually a five piece but the other guitarist Jan couldn't make the rehearsals and was therefore in the audience whilst the remaining four played their noisy, funky, beat-pop. It's difficult to define their sound - check out the two excellent songs on the Airpop CD. One thing is for sure - they are guaranteed to get you moving. Bernd's swirling 60's style organ sound, Daniel's choppy guitar rhythms, Yogi's punchy bass and Christian's fantastic drumming provide a rocking basis for the dual vocal assault of Bernd and Yogi. This band is extremely tight. The climax of their set saw Bernd hanging by his hands from an overhead bar, playing the organ with his feet! A great performance lads! MORE... Olaf and Andreas kept the music flowing after the bands playing some cool tunes. At one point, The Jam's 'Town Called Malice' was played. Excellent! Neale & Mark talked to many people, Jan from Mondfähre, Johannes, someone who used to live in Brighton (near us at home!!) and many other people. Neale autographed a single for a young lady (where was Mark at this time?) We had been up about 20 hours by the time we left the club (since 4.30am - almost a Five O'Clock Rise!) and were feeling tired but very happy. The people we had met were all really nice and friendly. It was a real pleasure to have played in Wiesbaden. THE NEXT MORNING... we got up very late (hey, it's rock 'n' roll!). The lads from Mondfähre came around to Hanns-Christian's place for breakfast which was very nice. Christian of Mondfähre was very pleased with a pair of sunglasses he had bought for 10 pfennigs at a flea market and insisted on wearing them at breakfast. Maybe he'd had too much beer the previous evening. Drummers eh?! We went back to the Schlachthof and walked around the flea market there. No more sunglasses for sale. THE GIG Next we travelled across the Rhine into Mainz near Frankfurt to the Wespenclub. A smaller venue than the Schlachthof but interesting because downstairs there is an art gallery and also Zentralstudio where the Apricot releases are mastered. The club was due to close at 10.00 pm and therefore we had to go onstage a lot earlier. Problems with an amplifier caused a short delay. Because of time, Neale & Mark decided to combine The Shining Hour and Fragile sets by choosing the songs which had been played the best the night before - it was hard choosing from so few! We went on first, about 7.15 pm and started with 'Everybody Says...'. Being a smaller club and less advertised than the previous evening, we played to about 50 people but it felt more relaxed. We included 'Worlds Apart', 'Four Seasons In One Day' in the set and finished with 'Useless' once again. At one point Mark jokingly asked to borrow Christian's sunglasses due to a blinding spotlight shining on the stage. Hanns-Christian guested again on 12 string acoustic for 'I'll Come Running' which was a truly great moment of the weekend. This evening Mondfähre played after us. Christian wore his sunglasses all the way through their set (was it because of the light or was it to look cool? - he did look cool!) His bass drum seemed to want to wander off stage and Bernd and Yogi struggled to push it back during the songs. After the previous nights' gig, the band looked more relaxed but again a good solid performance. Brideshead took to the stage last, this time without the brass section. 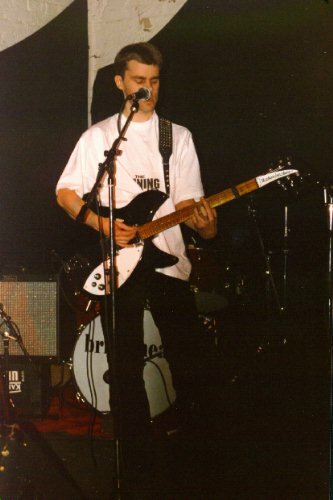 Brideshead also seemed more relaxed than the night before and played a good set. They sounded tight and as melodic as the CD 'Some People Have All The Fun'. Martin had to be careful with his jumping on the spot for fear of hitting his head on the ceiling. Neale commented on how tall everyone was... true - but we are short! It was a good evening and great to see Joerg Kruckmeyer of the Meller Welle Producte label who had come a long way to see us. Thanks Joerg! Joerg has a compilation CD out called '25 - A Silver Jubilee' of songs by international bands which have been released on his label over the years. Sadly, we had to say goodbye to Joerg and Mondfähre. Christian asked whether we would come back and 'tour' with them again. Yes! We would love to. It would be an honour! THE NEXT DAY... we met Brideshead plus girlfriends for breakfast at a nice bar/cafe in Wiesbaden. Lovely breakfast too. Afterwards, Martin and Sarah looked after us for a while and showed us some sights of Wiesbaden. Thanks. Hanns-Christian picked us up and then it was soon time to leave for Frankfurt airport for the journey home. We met some really lovely people in such a short space of time. It was a fantastic weekend - one that we haven't been able to stop talking about since. Rob and Steve know that they have missed out and want to come next time. It was hard saying goodbye to our friend, Hanns-Christian, who had been the perfect host all weekend. HC - we cannot thank you enough. Thanks also to Daniela for putting up with us! One last thing - Mark was stopped at airport security while some officials scanned his guitar effects pedals. Maybe they thought they were explosive devices but all they could find were traces of rock 'n' roll and badly played guitar solos! MASSIVE THANKS and GREETINGS TO: MARTIN, JOHANNES & HC (Apricot Records) for your all of your efforts with the records, CD and gigs. MARIKO for the design, TOBIAS for the mastering. OLAF & ANDREAS for DJ-ing, BRIDESHEAD - Zwen, Paul, Daniel, Martin and Hanns-Christian, MONDFÄHRE - Bernd, Yogi, Daniel & Christian. Ingo, Holger and Dirk from the RANDOMIZER show on StadtRadio Göttingen. Daniela, Sarah, Romina, Jan, Joerg, the Schlachthof and Wespenclub people and everyone that came to see us and finally, Hanns-Christian - you are a star! Neale and Mark rock the Schlachthof! Click to enlarge. Mark struggles to find the lost chord! Click to enlarge. Mark and Neale at the Wespenclub, Mainz. Click to enlarge. Hanns-Christian and Mark play 'I'll Come Running' at the Wespenclub, Mainz. Click to enlarge. Mondfähre at the Wespenclub, Mainz. Click to enlarge. Brideshead at the Wespenclub, Mainz. Click to enlarge.